If you have never heard of the Pareto Principle or Parkinson’s Law, get ready for a potential re-framing of how you tackle lighting work from this point on. On Stage Lighting uncovers a key secret ingredient to enlightenment through lampie-Jedi knowledge, and to improving your effectiveness as a lighting programmer. Partly though using a concept named after an obscure Italian economist. OK, so those of us in UK Higher Education have fallen over the line for another year and some students (almost) have their degrees in their hands while others are a few more steps closer. What does that mean in the dusty offices of On Stage Lighting? It means that I actually have time to write something other than academic documents and student feedback. Having pretty much dealt with a load of key lighting design and practice topics over the years, it is less often that this site sees new stuff, not least because we don’t believe in publishing for the sake of it. Today is no exception and for the feed readers of OSL, the new-stuff servers have been restarted for a very special reason. Today, we are going to look at two ideas that have the power to increase your knowledge as a budding lighting Jedi and generally make your life better, improve your chances with the person of your dreams etc. (OK, maybe not that last one). We need to think about the two generic ideas. Then we need to apply them to our world as lighting designers, programmers, and technicians. Other versions of the Law are about how work expands to fit the time available , blah, blah but basically, what we should care about is time being WASTED. The more time you have, the more time you waste – as many of my students would probably testify. Different elements of the entertainment industry vary, in my experience, as to how much fat there is in any production task or scheduled project. Some of this is down to culture and some depends on individuals. The On Stage Lighting challenge for you is to use your knowledge of Parkinson’s Law to be leaner and meaner and, frankly, head to the pub earlier. What the Pareto Principle suggests is that a only a proportion of what we actually have or do is producing the lion’s share of what we end up with. When it comes in conjunction with Parkinson’s Law, one can also turn this its head and speculate that 20% of the result takes up 80% of the time, for example. Time more or less wasted. In reality, these numbers are pretty arbitrary. One may equally argue for 90/10 or 99/1. No matter, it’s the idea that is important. So what does all this have to do with stage lighting? You start by programming Groups, add some extra permutations and even end up saving “DSR Ladder Washes Only Even Minus the Top One” – just in case. You never know when you might need that group. Now it’s palettes time. The basic colours are already in but hell, you aren’t the kind of programmer that feels worth your money if you simple rely on O/W, Red, Blue and the like. No, you must program up some additional colours. Oh, and sort out a load of gobo spins in all directions – just in case. Colours and Beams – plenty of. At this point, we are assuming that you aren’t a primarily theatre programmer and already get the fact that you are not trying to program cues (lord help you) but stuff that you can add together to make myriad looks on stage throughout the night. That is to say, you are already familiar in the ways of the concert busking world. If that was a big assumption, just stop trying to make full cues right now and go and read Concert Lighting Programming in 30 Minutes. Better? OK. Making full state cues (and making a lot, so the audience don’t get bored) is not the order of the day for this one. Incidentally, this particular way of thinking is quite a big transition for learners coming from their first forays into working with a lighting desk on theatre shows, so it’s not a big deal. Only once you have run the show does it become apparent that 80% of the actual show is made up of 20% of the programming – or worse. If you were honest with yourself, you could have actually used that lot for the 100% of show and it may have been easier to access as the good stuff (AKA the stuff that you remembered you could actually use and make work) wouldn’t be spread across 50 playbacks and mixed up in that stack congaing the PAR chase, the steps of which you based on the square root of ?1 , In and Outs. If you were lucky, you actually only had 30 mins of programming time. Parkinson’s Law sats that having 4 hours would likely result in 20 mins worth of useful programming and 3 hours 40 of obscure FX combinations. You can see how the Two Ps relate to each other in this example of real world lighting programming practice. The examples above relate to programming on a specific kind of show, but we can bet you are already thinking of ways in which Parkinson’s and 80/20 relate to work you have done or situations in which you find yourself. Once you know about these two concepts, they seem to spring up out of every situation you find yourself in. In the example above, 20% of the programming contributed to 80% of the show – or more. 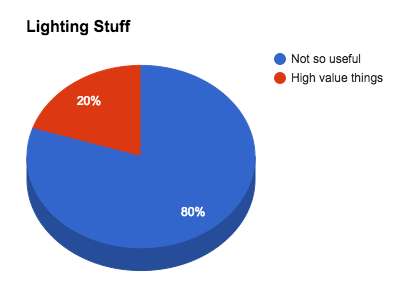 So what about Pareto et al in other lighting situations? 80% of the rigging process takes up 20% of the time. The rest of the time is spent faffing about with odd stuff and booms. 20% of the faults take up 80% of the snagging time. 20% of the colour choices are used in 80% of the looks. 20% of the rig provides 80% of the value. One word, Molefays. Case Closed. 80% of the design is created in 20% of the time. This also relates to drawing the plan. Shorten scheduled time for tasks. Decide to stop programming at a certain time, for example. Go to catering. Don’t create time that you can then waste. Avoid half-working on stuff. Either work or don’t. (Do. Or Do Not. There is no ‘try’). If you are half-working is it because you don’t really know what needed doing next? Fine, make a plan/list. Are you subconsciously fitting in with the schedule? Be aware of pre-programming sessions using a visualiser. It could be a route to un-productive programming via an extension of the time available to waste. The result can a be a mess to deal with on the day. Decide on EXACTLY what you actually need to rig/do/program in order to get this show to an acceptable standard. For programming, make a list and check them off as you go. Try to work out which activity is taking you 80% of the time, for only 20% of the result. Address that and consider what the consequence of just not doing it would be. I mean, really not doing it at all. There is a lot more to getting the best from ideas behind the application of Parkinson’s Law and the Pareto Principle to production lighting practice, this is just a taster to get you thinking. The principles look different across scenarios and between genres as each has its own signature series of tasks and behaviours. Touring and One-Nighters are obviously not going to be exactly the same. The key takeaway here is that time applied to something and the final results are not as closely correlated as the protestant work ethic would have you believe. Be critical of your approach to programming and other lampie tasks. If you have any examples of Parkinson’s or the Pareto Principle from experiences in your own lighting world, stop by and share them in the comments section. Thanks, lot of insightful stuff, it put words on some thoughts I have had when comparing how much time I use at two different venues with almost identical setups. One place I have one hour and it works out fine, even have time for a sandwich and a chat with the bands. The other I always find myself stressed, skipping the free meal and then performing worse. Really interesting examples, Beau. Cheers.